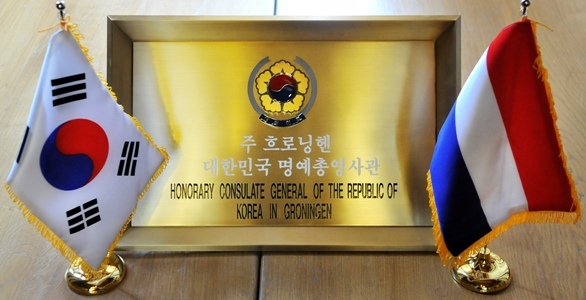 Professor Sibrandes Poppema, President of the Board of the University of Groningen, has been nominated Honorary Consul of the Republic of Korea. Today, Thursday 12 April, the official inauguration by H.E. Key Cheol Lee, Ambassador of the Republic of Korea, took place in the Academy Building of the University. As a pathologist, Poppema has been active in academic collaboration with the Republic of Korea since 1990; he has been engaged in teaching and research at several Korean universities and research institutions. During the past few years, he has also been active in institutional cooperation with higher education institutions and government bodies in Korea. ‘Korea is a very important trade partner for our country’, the new Honorary Consul General said after the inauguration. ‘And we would like to welcome many more Korean students to Groningen. Koreans fully realize that education is the way to democracy and prosperity. Korean parents are used to sending their children to the best schools and universities, so we have common goals. Last modified: 06 February 2019 2.44 p.m.